Whether recording and producing multi-platinum artists, talented up and comers, composing music for film, working as a session guitarist or performing on world stages, Terry Derkach has enjoyed the fruits of a diversified 20+ year career. Having worked under legendary names Bob Clearmountain, Kevin Killen, Michael Brauer, Lincoln Clapp, is also an accomplished recording & mix engineer. 2006 brought the opening of VRTCL (pronounced "vertical") Entertainment his recording and production facility located in New York City. 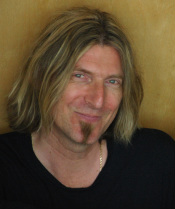 Recent music production and writing credits include: 3x Grammy nominated, multi-platinum artist, Brad Roberts (Crash Test Dummies). gospel vocalist, Vernon Bush (Stevie Wonder, Nancy Wilson, Ray Charles), Gary Lucas (Jeff Buckley, Capt. Beefheart, Gods & Monsters), "Manitou", including members of The Scissor Sisters, David Bowie, Brand New Heavies, David Byrne. Marco With Love, The Bros Landreth, Abigail Rockwell and Brendon Hamilton. He is the co-founder of Hookist. a music co-creation platform for celebrated artists/bands and their fans that revolves around a collaborative songwriting experience. It is a series o month-long songwriting EVENTS where fans of artists and songwriting, submit lyrics and engage with the artist, and together as a community write a song. It is also an opportunity for the artist(s) to engage with their fans in a ground-breaking new way that is actually RELEVANT to their art and meaningful to their fans. Recent film projects include; Amy Winehouse (Interviews), Kill Your Darlings (ADR), Stuck (ADR, Sound Design. Mix), Love Locks (Composer/Mix), La Redempcio dels Peixos (Mix), OXD (Mix), Tsuzuku (Sound Design/Mix), A Boy Called Boris (Mix) and Sharbat (Composer). A diverse roster of celebrity commercial clients including; Tony Robbins, Russell Simmons, Peter Guber, George Foreman and Barry Levinson to name a few have also sought out his expertise.